Just west of Lake Michigan and centered on Millennium Park, the Chicago Athletic Association reawakens the dormant 1893 Venetian Gothic building originally designed by Henry Ives Cobb and its many additions, refinements and renovations that tell the story of the club’s 100 year plus history. Constructed in a moment of frantic development spurred by the Columbian Exposition and concurrent with a period of remarkable architectural innovation, the Chicago Athletic Association was founded by a collection of prominent families whose names have become synonymous with American sport and athletic commerce, such as Wrigley, Comiskey, and Spalding. Not the first athletic club in Chicago, or even on its block, the founders named their charter with clear ambition to be its foremost. The club itself has had its moments of mischief – it opened in 1890 as a premier men’s club and has a full history of competition and its members more colorful frolics with women, who were forbidden from entering the club except on Wednesday evenings and Sunday afternoons, a rule which was not lifted until 1972. Shuttered in 1997, this American treasure was nearly lost to the world with development plans to demolish all but the original facade, making a meaningless set piece of what is a much longer, nuanced and complex story. The still intact building was rescued from that fate by a fortunate partnership of proud Chicagoans – Ben Weprin, the owner of forward-thinking development company AJ Capital Partners, and John Pritzker, owner of hotel operator Commune and part of an important Chicago and hotel family who are also the patrons of many notable buildings in Chicago, including The Jay Pritzker Pavilion across the street in Millennium Park. Together with Roman and Williams, this team united to create this legacy project, combining their skills to make a new Hotel which is inspired, relevant, and contemporary but with deep reverence for the building’s remarkable architecture and history; a mixing of the old and new guard. The building was the essential inspiration and foundation for Roman and Williams’ approach to the project. With a great devotion to American historical architecture, the firm encountered the most intact historical building they had ever seen or worked with when they began the project. A well-preserved space tends to inspire careful and precious treatment and can result in a conservative final experience if the bravery of invasion isn’t embraced. A touch of disorder within the order keeps a space fresh and draws in a younger community, one who has an interest in embracing a historic tradition with a sense of irreverence. In contrast to its past, Roman and Williams felt that the building should feel incredibly inclusive rather than exclusive, and focused on breathing new life into the building by bringing in references from many different periods, speaking to a wide range of audiences. In their approach to the design Roman and Williams recognized that, as with popular sports at the turn of the century, the building included many iterations, re-interpretations and modifications to its original structure; thus, this newest intervention would merely add another layer in the continuous timeline. 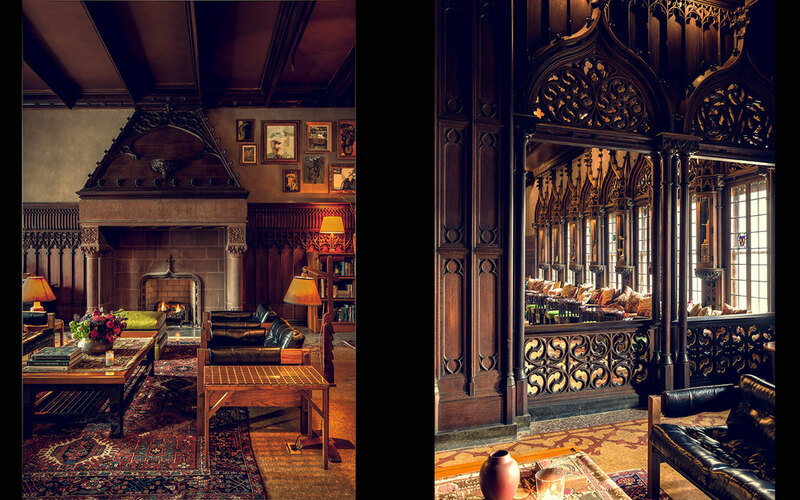 From colossal 19th Century fireplaces, complete with Oak Bas-reliefs, to the swank late modern Cherry Circle Bar, the building parallels the narrative of American urban cultures and aesthetics. Inspired by the abandoned athletic equipment littering the site when they arrived and also by the collection of dusty furniture, objects and lighting accumulated in the building over time, Roman and Williams developed a unique design language that refers to the layered, lacquered and leather-embellished construction of racquets, clubs and sticks. These elements are accented by eclectic but well-made furniture, much of it sourced locally, that a family or club has collected over multiple generations. Over the past several decades, the very notable paintings from CAA were auctioned off, with less prominent paintings stored in the basement. These were discovered by Roman and Williams and firm principle Stephen Alesch quite literally “invaded them” by painting original work on top of the traditional, creating much of the art for the rooms and the public spaces. In addition to the art, trophies, which may not be what they first appear, adorn the reinstallation of busy bars and restaurants. Roman and Williams added an area for traditional gaming that embraces that athletic-based design language, reinventing such classic activities as bocce, billiards, shuffleboard and HORSE, opening the Chicago Athletic Association’s original spirit and breath of activity to the wider population of Chicago and her visitors. Guestrooms reference the club rooms of the past with armoire, desk and bar designs referring to the stretching racks used for physical exercise, but tailored to address every need for rest, work and leisure. 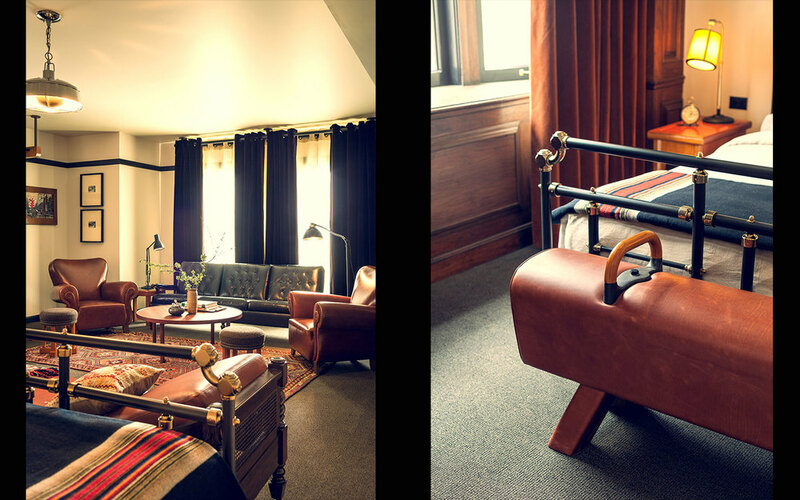 The masculine wood and leather details of these elements are offset by the collection of vintage oriental rugs, a modern twist on the brass bed, and national parks blankets at the ready for the coldest of Chicago’s winter nights. Bathrooms are crisp, clean and functional, with porcelain tile and light fixtures, an elegant Carrara marble vanity with nickel fittings, and a touch of shiny blue metal in the accessories, adding the ‘third’ color in the palette inspired by great athletic uniforms. Perfect for transitioning from a day on the court to an evening is the new rooftop bar. Guests take a dedicated elevator to a new rooftop ‘greenhouse’ addition, inspired by glasses houses from 19th Century botanical gardens to the Grand Palais. The space is a romantic notion of what may have been on this site before the wave of development swept the fields by the lake. The bright steel construction and curved glass vault of the skylight create a friendly, inviting atmosphere at all times of day. Roman and Williams embraced the Midwestern tradition of the garden party in this highly urban setting, infusing the space with a casual and organic yet elegant quality. The slightly pastoral touch and twinkling lights reminds Guests this is a place of respite, a secret getaway for relief from daily urban activity and a perch from which to observe that same busy skyline, juxtapositions which define the overall concept for the entire Chicago Athletic Association. The glowing honey bar with its sweeping view across city, park and lake is the ultimate venue to enjoy a cocktail and take in the story that is Chicago.